Andrew Dervish was born July 20, 1979 in Jakarta was the founder (founders) of Indonesia's largest online community, Kaskus Kaskus.us the website currently has more than 3 million members. Andrew currently serves as the Chief Technology Officer (CTO) PT Darta Media Indonesia (Kaskus) and owner (owner) Network Kaskus Indonesia through PT Darta Media. Andrew begin their education in elementary Tarakanita Pluit Jakarta, and then continued his education at the junior Tarakanita Pluit Jakarta, after graduating from junior high school and then chose to continue andrew Gandhi National School, Ancol Jakarta '98, after graduating and then Andrew melajutkan studies at Bina Nusantara University, 1998 Department of Information Systems, After studying at Binus, Andrew seek other universities 'support' his new hobby. He had trouble finding a suitable university in Indonesia, because at that time not yet a land multimedia livelihoods in Indonesia. But eventually she found through the information of a friend who had just returned from America. A university named Seattle University judged the deep desire to facilitate web programming world. At first, both parents Andrew disagree with his wishes. They think college would be too soon to spend money, not to mention the cost of living there. But after pressed by Andrew, eventually they yield well, provided that the cost of living during college in America to bear alone. Andrew menyanggupinya. Then he chose to continue his studies abroad at the Art Institute of Seattle, 1999 - 2003 majoring in Multimedia & Web Design, after which he continued his master's degree at the same university majoring in Master of Computer Science, Seattle University, in 2004 to 2006. Kaskus Andrew founded on 6 November 1999. 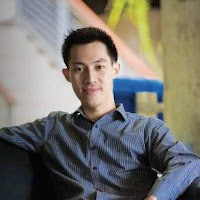 Starting from his experience while studying at one of the leading universities in the land of Uncle Sam, Seattle University, Program Multimedia & Web Design, Art Institute of Seattle Computer Science in 1999, a man called Andrew was inspired to create a website community forums that can be said be the largest in Indonesia. "I was assigned by the teacher to make a program of free software, that's where the idea started to make a website with the name Kaskus." Andrew said that work at the company lyrics.com in college in America. Kaskus derived from the word meaning gossip or gossip. With an initial capital of U.S. $ 3 (USD 30.000, -) to buy a server, Andrew and his two companions, Ronald and Budi, choose to create a portal that contains news and information about Indonesia. Portal is intentionally made to be a medium to satisfy the longing for the Indonesian people who are in Overseas. The benefit was the improvement in online business stretching, and the number of people who start an online business seen Andrew as a great potential to support the development Kaskus. Based on the survey, there are over 40 million Internet users in Indonesia. With an incredible amount, he assumes that each Internet user is a potential target market. Barriers Andrew admitted that she experienced at the beginning of the toughest obstacles Kaskus formation. He should immediately intervene and fix if there is a server down, because it was Andrew not have employees. In addition it is also the toughest obstacles experienced when moving to Jakarta, karenai he must convince the customer and the advertiser about the image Kaskus. Marketing Andrew and his team at the beginning of the business must bergeriliya door to door to clients to introduce Kaskus positioning and less than 1 year, Kaskus has been trusted by many large clients only supports Kaskus Kaskus since it was first launched in December 2008. 2 months later then officially become a professional Kaskus under the banner of PT. Darta Media Indonesia. There are currently Kaskus has 3,730,031 members (update pertanggal December 3, 2011 at 11:55 pm) and continues to grow every second. Kaskus has a target market of 15-40 years of age both among students, workers, professionals and entrepreneurs. Also received numerous awards including The Andrew Indonesian Best Communities for 2005 and 2006 versions of Alexa.com and Wikipedia, with nominations from Microsoft Indonesia Kaskus Top Innovative Web Site in 2008, and the nomination of Indosat Kaskus The Online Inspiring Award in 2009 Currently for managing Kaskus, Andrew assisted 30 employees are divided into teams of marketing (marketing), sales, IT and creative (creative). With so much content in Kaskus.us, without doubt Andrew called Content Purchase (FJB) and Lounge as a visit to newbie. The newbie who come from all corners of Indonesia that could use this content for online business transactions. In one day alone, 80 thousand a list of items, included in the Buy & Sell Forum (FJB). Andrew obsession to be achieved for the development of its online business is to continue to develop content (existing facilities within the website) in Indonesia, so that later people outside negerilah who would buy that content.